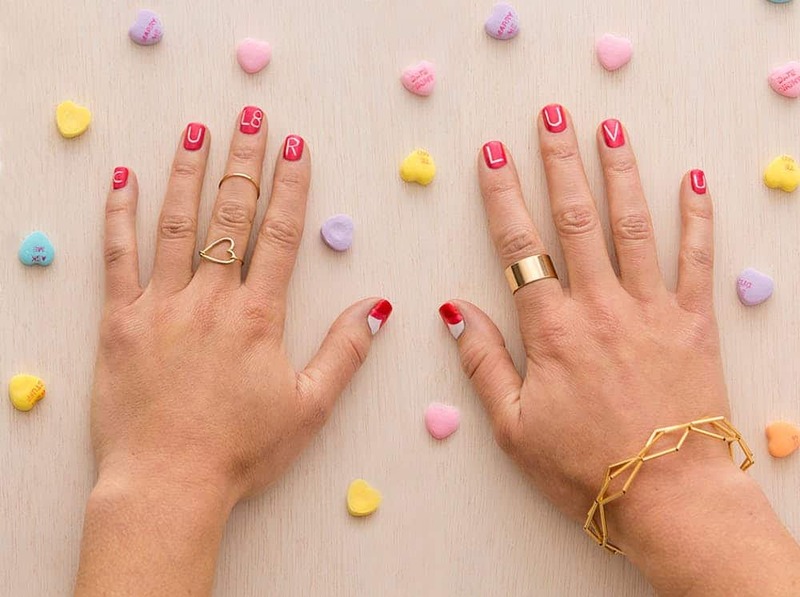 Soon it’ll be February 14th and you’ll be preparing your hot, date night outfit complete with accessories and some fresh digits, of course. Before Cupid’s big day rolls around we’re giving you some beauty inspo that you can create on your own. 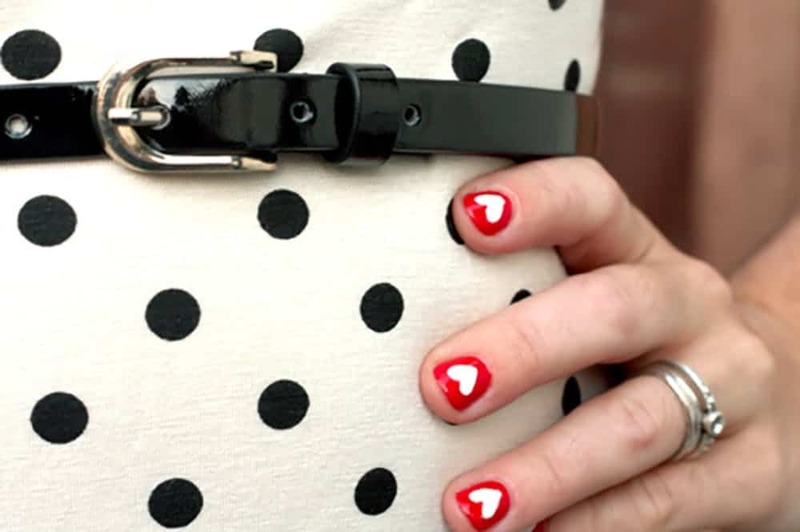 These 15 DIY Valentine’s Day-inspired manicures can be done at home with no issues and not a lot of experience under your belts either. Let’s have a peek at some awesome (and festive) tutorials. Brit and Co will teach you how to make this easy design come to life. Inspired by the conversation hearts we all love, they’re filled with personalization opportunities and fun shades of hot pink and red. Check out the tutorial after the jump. 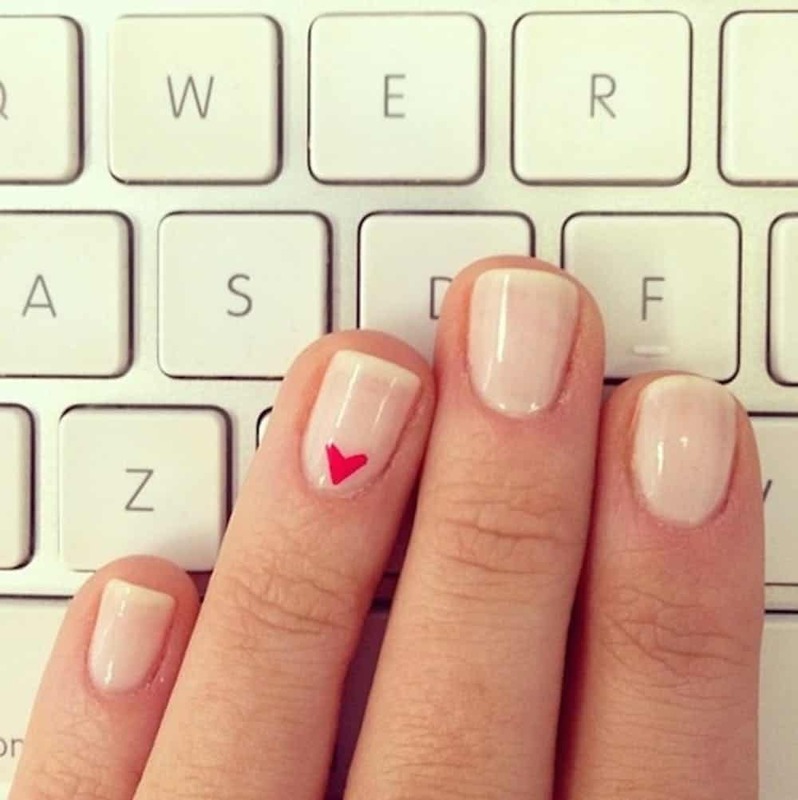 We love the addition of the single, mini heart in this clean nail design. 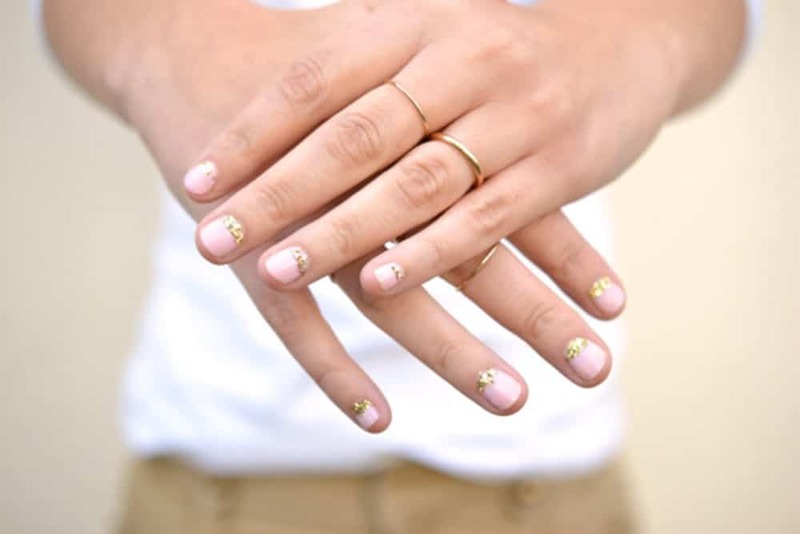 Found at Lauren Conrad, we love the simple hint to the holiday and the delicate, feminine nature. 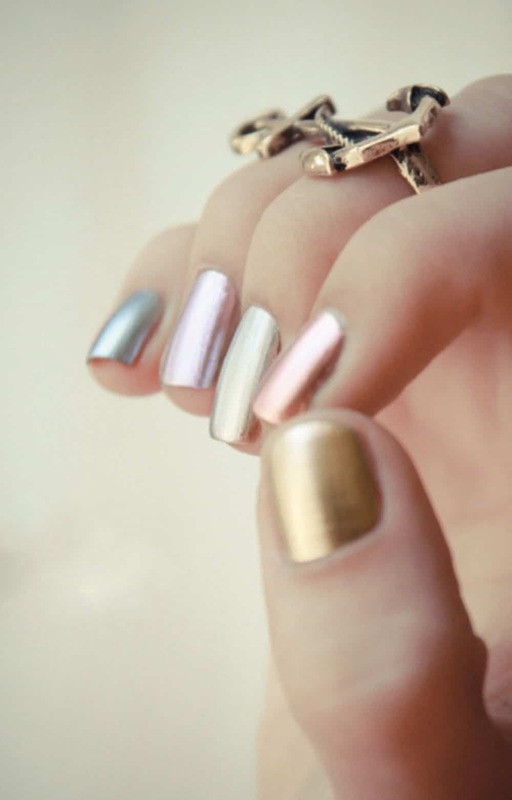 You can do this with all shades you love as well. 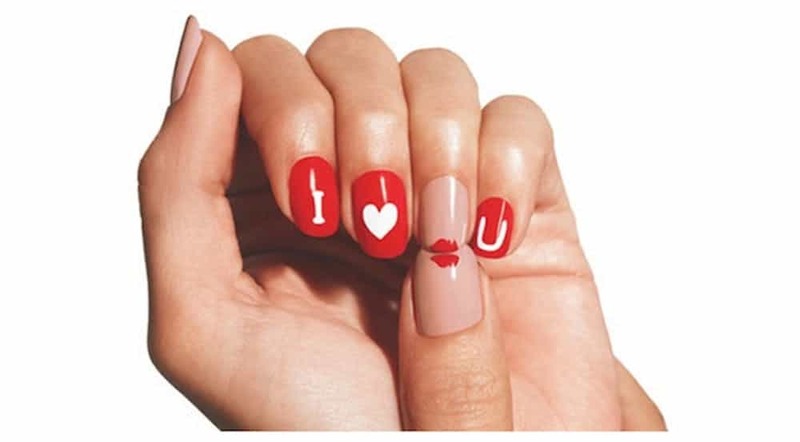 This design is complete with an “I Love You,” and a kiss to top it all off. Just look how realistic that tiny lip stain is! Visit Zen Magazine for all of the details. Some simple white hearts can do the trick as well. We found this one while perusing Julie Ann Art and fell in love with the ease. Red or hot pink can easily be kept as your foundation shade. Here’s a fun spin on a classic look. So Nailicious took a French tip nail and added some extra festivity and punch. 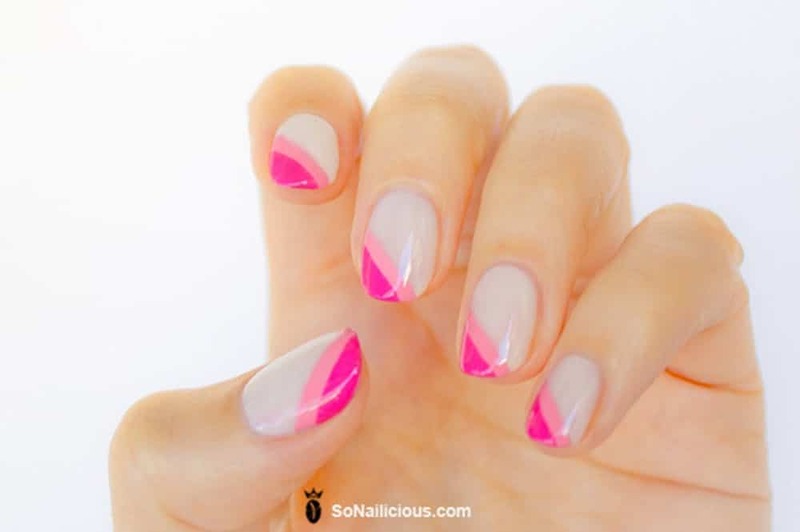 A diagonal pink design can be just what you need to finish off your Cupid’s Day date night look. You could do some color blocking as well. It’s a subtle nod to the holiday without being overly kitschy and still meet your modern style goals. Grab the inspiration from Isla Everywhere. If you’re a lover of blue, you can incorporate that into the holiday as well. Pshiiit did it and we think it’s beautiful! 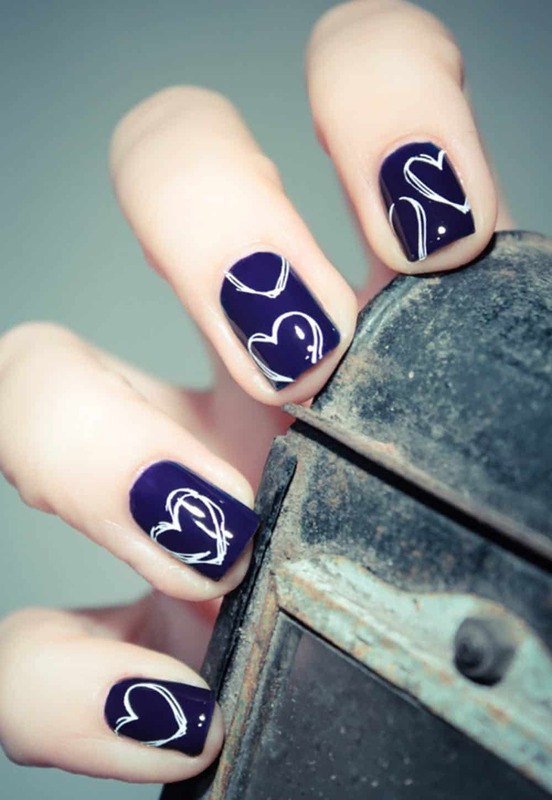 These blue violet hearts are the perfect topped on your February 14th look. This is another classic Valentine’s Day combination on all accounts. We found this one at …love Maegan and immediately fell in love. It’s a bit glam. It’s a bit bold. And it’s perfect to celebrate with. This ombre selection utilizes the classic colors of the holiday. 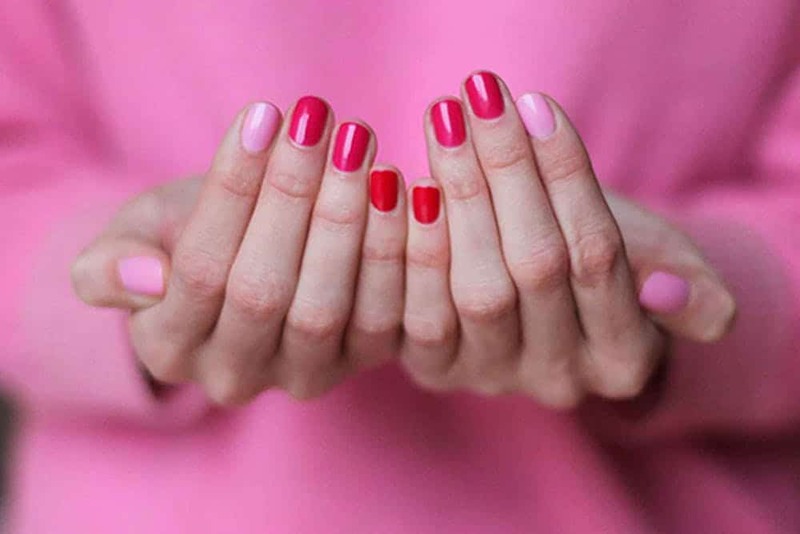 A bit of pink, hot pink, and red some together nicely to make one beautiful mani. Check it out at Miss Renaissance. Some pink and some glitter is always a great idea when it comes to the Valentine’s Day. Born in 82 will provide you with the details behind they’re creation and you can spend some time recreating it for yourself. 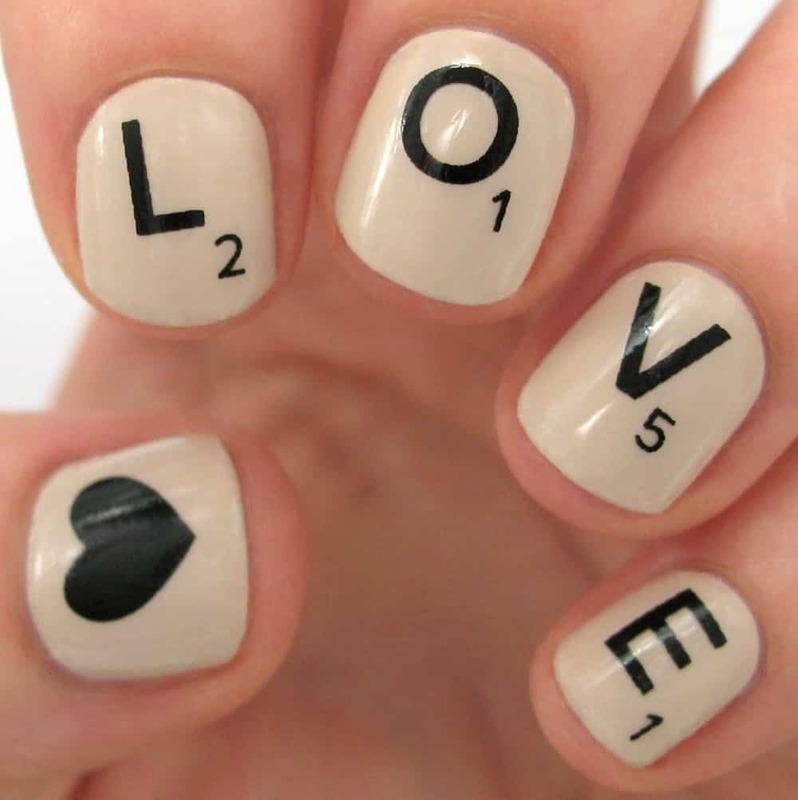 How about creating some heart tips for your digits? It’s so feminine, festive, and delicate, don’t you think? Do it with any shade you like just grab some “tips” for your tips at …love Maegan. 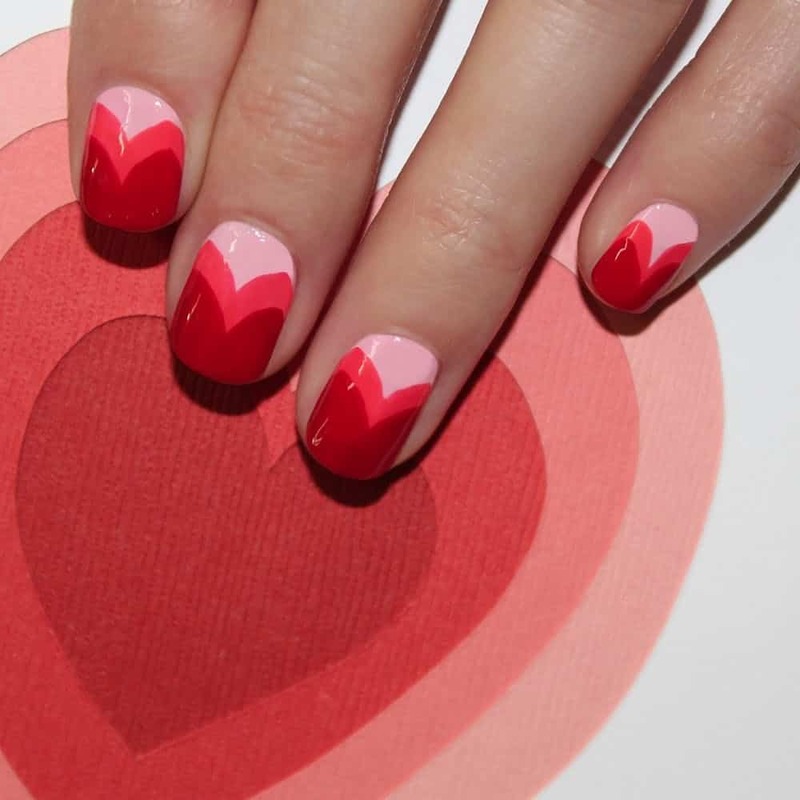 There’s so much to love and create when it comes to these “extra” Valentine’s Day nails. There are different colors, textures, and appliqués utilized here. 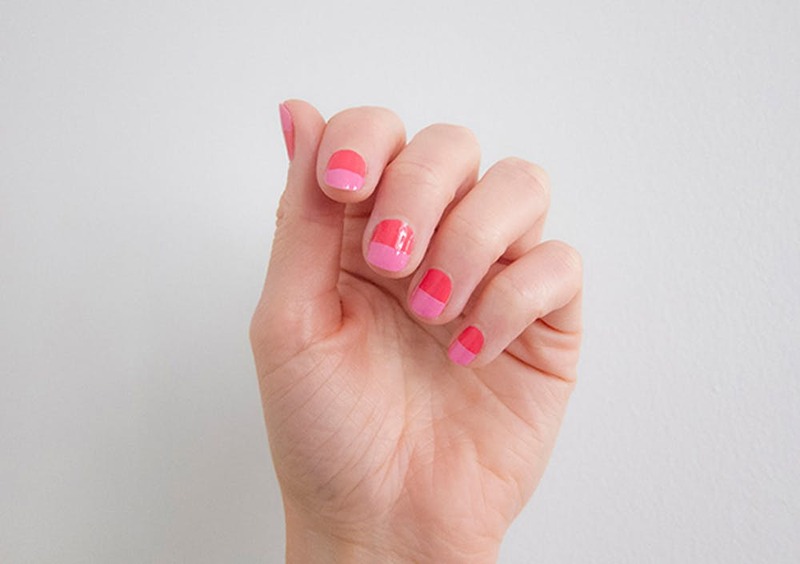 Test you skills with some help from Chalkboard Nails. Who loves a good game of Scrabble? 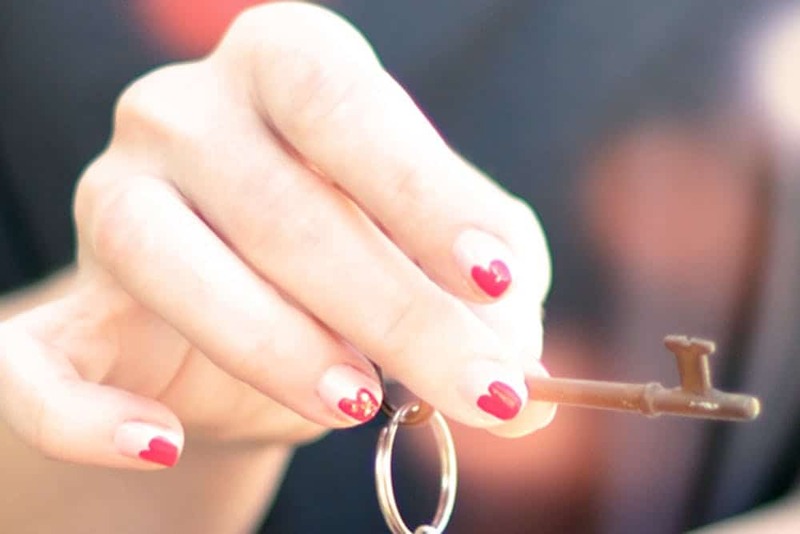 If you’re one of them, mix that love with the day of love for the ultimate, playful nail design. Grab the tutorial by visiting One Nail to Rule Them All. Pop sugar gavels this bold and beautiful design to fall in love with. We’re swooning for the layered pink heart-inspired shapes and how you can make this come to life so much easier than you may think. A pro really isn’t needed for this one! This one is a more subtle nod to the holiday with its glam appeal and pretty shades. Check out Pshiiit to found out all the information behind these stunning digits and how to make it happen in your neck of the words.